Continued strong iPhone and iPad sales, surprisingly good Mac sales, and a rising Chinese market gave Apple a very healthy start to its 2014 fiscal year. According to an earnings report released Monday, Apple wrapped up the first quarter with a $13.1 billion profit on $57.6 billion in revenue. That compares to $13.1 billion in profit on $54.5 billion in revenue the same quarter last year. (To be precise, overall profits were in fact down just a bit, from $13.078 billion in the first quarter of 2013 to $13.072 billion this quarter.) Earnings per share were better than expected: Analysts had predicted $14.09 per diluted share, when in fact earnings per share were up 5 percent to $14.50. 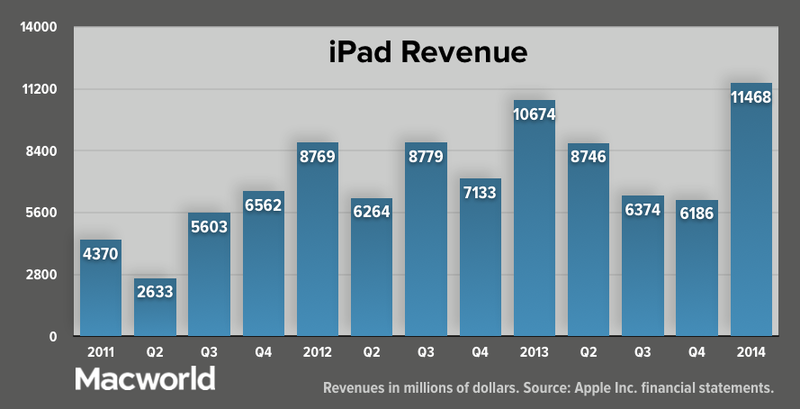 The company said it sold 51 million iPhones (a new quarterly record) and 26 million iPads (another new record). 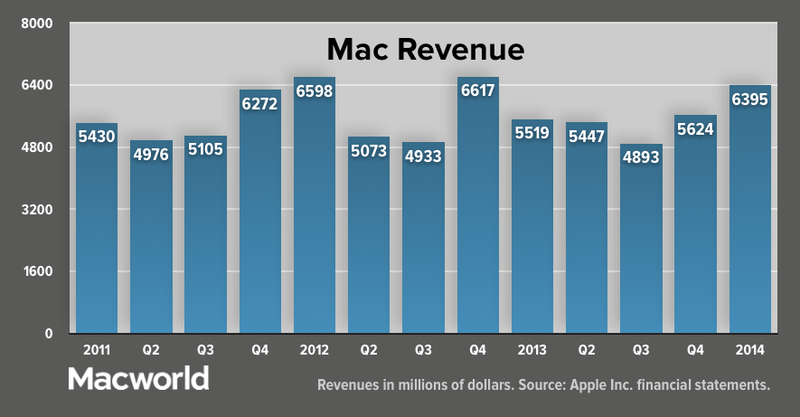 Mac sales were surprisingly strong, up 19 percent over the year before, to 4.8 million units. However, the company's projections for the second quarter of 2014 are likely to be unpopular: It projected quarterly revenues of $42 to $44 billion; analysts had estimated $46 billion. For more, check out our liveblog of the earnings call. 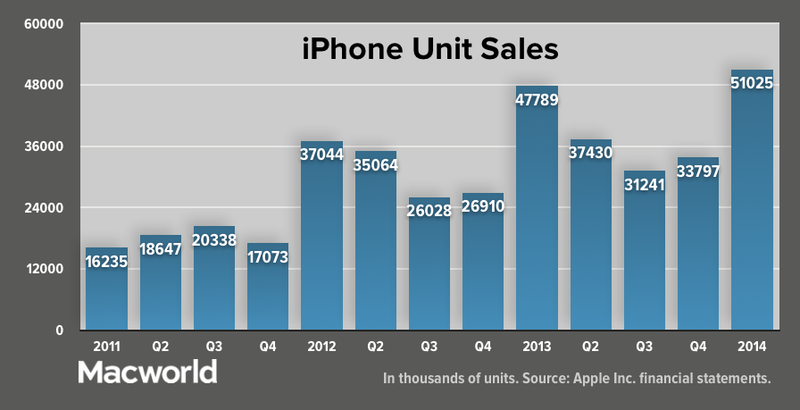 With roughly 51 million handsets sold, iPhone sales were up about 7 percent over the first quarter last year. That's no doubt thanks to the introduction of the iPhone 5s and iPhone 5c, which debuted just a few days before the start of the quarter. 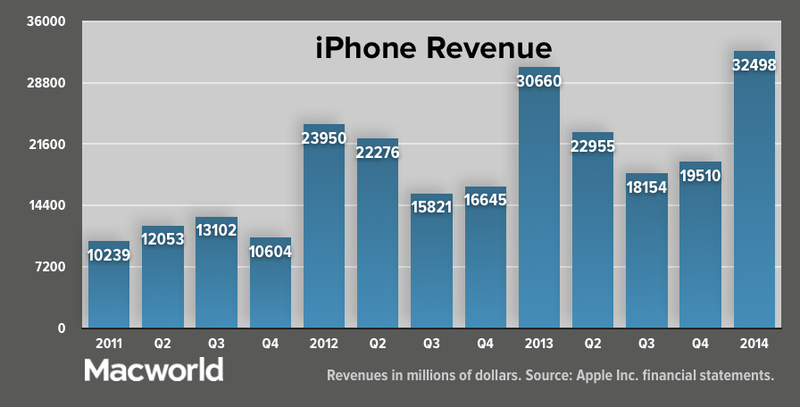 Revenues from iPhone sales were a tad lower than that, up 6 percent compared to the year before. The iPhone accounted for 56 percent of the company's overall revenues—about the same as last year. That said, Apple CEO Tim Cook admitted to analysts that those new phones didn't sell quite as the company had predicted: "As we entered the quarter and forecasted our iPhone sales...we actually sold more iPhone 5s's than we expected....it took some time to build the mix that customers were demanding." 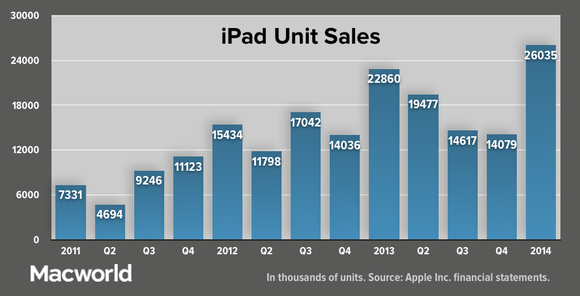 iPad unit-sales were up about 10 percent over the first quarter last year (26 million vs. about 23), but revenues were up just 7 percent. Apple specifically called out the success of the iPad in the corporate market as one of the keys to those sales: According to Tim Cook, the iPad is now represented in 98 percent of Fortune 500 companies and 93 percent of the Global 500; 90 percent of tablet activations in corporations, he said, are now iPads. Driven largely by the iMac and MacBook Air, Mac sales were up a robust 19 percent, with accompanying revenues coming in 15 percent higher. And that's in an overall PC market that declined 6 percent in the same period. 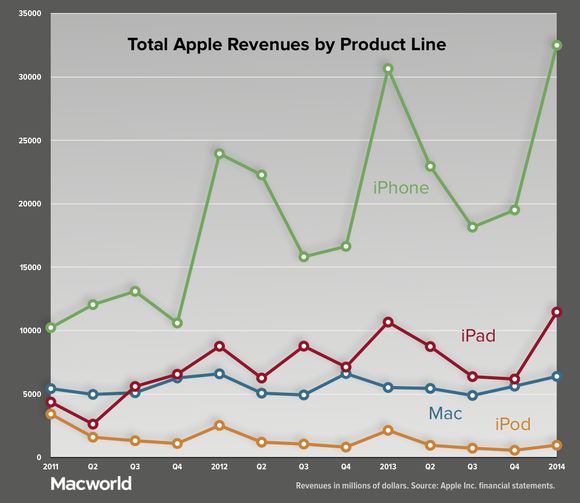 Macs have gained global market share in 30 of the past 31 quarters. What happened to the iPod? Unit sales plunged 52 percent, while revenues dropped 54 percent. 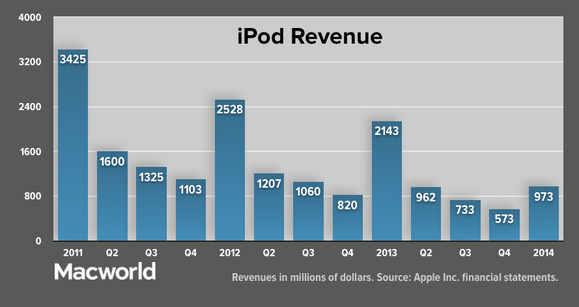 That means the iPod is contributing just 2 percent to Apple's overall income—half of what it was last year. The big story in Apple's numbers: Its revenues from the Greater China market soared 29 percent. And that's before the company's deal with China Mobile to sell iPhones there kicked in. Apple CEO Cook cited strong iPad and Mac sales, which were 64 percent and 28 percent year-over-year respectively.